Whether you’re welding in a workshop or cutting wood in your garage at home, having the best bench vise for the job at hand is vital. These low cost, multi purpose tools will save you time and even act as a helping hand to get the job done. However, finding a top quality bench vise can be time consuming. Fortunately, we’ve made it easy to choose the right vise for you. We’ve compared top brands like Wilton, Yost, and Tekton and have given you the low down on the specs available, including throat depth, jaw opening, and jaw width. View the Best Bench Vise for the Money, Below. How Does a Bench vise Work? What are Bench Vises used For? Who Makes the best Bench Vise? How to Install a Bench Vise? There are many options available and it can be hard to get a grip on what the best choice is, especially when a bench vise is not a tool that you can try out beforehand. So what is the criteria that a vise must possess to be a contender for the best bench vise of 2019? For a start, a good bench vise should be easy to install, either directly to the bench top or via a clamp or stand. A quality bench vise will also not mark your workpiece while it is in use. If you are looking for strong and sturdy in a vise, which you obviously should be, then the Wilton ticks all the boxes. The blue powder coat finish of the Wilton is a standard colour in the world of bench vises, but is finished to a very standard. This vise is every inch a workhorse, perfect for beginners and experienced craftsman alike. It is made of strengthened steel that makes it an almost invincible vise, but not at a cost of its weight, at 7kg it isn't a mammoth to install or to handle. The best vice placement is a simple choice as the unit isn't static thanks to a clever design. The vise has a swivel base that allows you to work with a ease that is sometimes taken for granted when you are working on a workbench. No more craning your neck around a piece or shuffling around a bench to get the best angle. The vise opens to a 4 inch opening which is best for benchwork. The jaws have a diamond-machined finish for an extra secure grip, regardless of the material you are working on. The strong design comes in even handier when you take the anvil-back into consideration. It is a little larger than is usually seen on a vise like this, but that is a pure plus as it is a well made feature perfect for bending and flattening any of your metal projects. The anvil absorbs the vibrations of any hammering on metal, and makes this vise perfect for your metalworking projects as well as woodworking. Many vises have the anvil feature, but in this vise is definitely there for use and not just as a design afterthought as it obviously is on some vises. 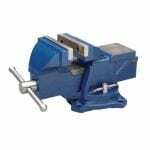 See more information on Wilton 11104 Wilton Bench Vise 4-Inch. The Wilton is a great piece of kit. It is best suited to beginners or for smaller projects, as it opens to a 4 inch gap. It is a workhorse and being made of highly strengthened steel means it will last a hell of a long time. The anvil area is a very nice size, negating the need for a separate area to bend your metal work. A swivel feature is something that people take for granted in a bench vise, assuming they will need a staic vise. But as soon as you use the feature you will know you made the best choice. The swivel was smooth and easy, no chattering or sticking around the curve. A fantastic vise. Available on Amazon, this bench vise is not designed just for casual work, although it is up to you what you use it for. The Yost Multi-Jaw has an industrial strength iron construction and is best suited to be used and to take one hell of a beating. The jaws are a fantastic 360 degree swivel design that is comprised of 2 types of jaw grip. The rotation feature can be activated by a pull-pin mechanism found on the back of the vise, instead of the usual turning mechanism which can lock or jam and needs a larger range of movement to operate. This allows the movement to be done one-handed, and allows the vise to rotate and lock into one of 12 positions without stopping what you are doing or needing to readjust your position. The jaws feature the standard flat opening on one side, yet when swivelled 180 degrees it becomes apparent that this side is for any pipe or tube work you have. The pipe work jaws are self-aligning, making sure that there are always the greatest number of contact points as possible instead of the much inferior smooth grip. Meaning no slipping, no scratching and no injuries from wayward tools. This is not the standard fare of features for a bench vise, and they shouldn't be taken for granted. The Yost Multi-Jaw is ultimately an incredibly feature heavy vise and an actual workshop spacesaver. It also features a swivel base, as is always useful when working, and allows an ever greater degree of accuracy while you are working with a hand tool as there is no need to keep inserting and removing the piece you are working on. It is a more advanced design then people tend to look for, but none of the design features here are superfluous or just added on. See more information on Yost Vises Multi-Jaw Rotating Bench with Swivel Base. The Yost Multi-Jaw is a heavy duty bench vise. Its is a perfect all-rounder geared best suited for serious amateurs or even professional workmen. It would look wonderful on any workbench, and it is built to be used and abused. The pipe feature is not common as standard and it suits all plumbers and even some engineers. This vise can handle any project you undertake and would be pride of place on any bench in any workshop or garage. The Yost LV is quite a small bench vise, measuring at only 4 and a half inch. The Yost LV is sporting a design that has recently been improved for more stability., thus making it superior to its predecessors. It is made in cast iron, so in this case small does not mean weak or hollow unlike many of the small bench vises that are available to buy. It is so easy to install on your bench, so simple in fact that any idiot could do it. It is strong and stable and perfect for home bench use or for small workshops. It comes complete with a small anvil area for you to take a whack at. The Yost LV is incredible for the price that it is available for. It is more suited to smaller projects due to the jaw opening size. It is perfect for small projects and is highly adept at securing tools for sharpening and such. The strength is unrivalled in a vise of this size, and as a cast iron piece the price was a pleasant surprise. See more information on Yost LV-4 Home Bench Vise. The Yost LV is great value. It houses a strength that is usually lacking in bench vises of this size. It wouldn't be suitable for big jobs as the jaws only have a 3 inch opening which can be a tiny bit limiting in terms of the sizes of pieces you are working on, but for the price it is well made and will last a long time in your workshop. A great vise for beginners or even the thrifty. The Yost 445 utility bench vise is another great offering from leading brand Yost. The 360 swivel is a great feature that adds another facet of ease to the way you work. It has a solid construction of reinforced steel jaws and a cast iron base, with the jaws cast in place so they wont rock and shake after a bit of use. The standard jaws open to 4 and a half inch wide, and the Yost 445 also features pipe jaws suitable for 0.125 inch to 2 inch diameter pipe or tubing. See more information on Yost Vises 445 4.5″ Utility Bench Vise. Available to buy direct from Amazon, the Yost 445 utility bench vise performs as well as you would expect from any vise from Yost. The 360 degree base is a feature that is somewhat taken for granted, until you find yourself contorting yourself around a piece of material to see the other side. Pipe jaws are always a welcome bonus on any bench vise, as it negates the need for another vise, or replacement jaw faces. The TEKTON is yet another great all-round offering in the bench vise market. The TEKTON is cast iron, wi th one of the bes finishes seen on a vise with a black powder coat with steel accents. Easy to install directly onto the work bench, the TEKTON is built to be strong with 30,000 PSI tensile strength. simple and useful. The base is incredibly strong, and utilises a 120 degree swivel. The anvil at the back is polished and ready to be used to bend metal at your will and can handle the intensity of the repeated hammering required to bend or flatten metal. The handles and main screw are strong and smooth with none of the slight stiffness that can usually be expected from a vise or any tool, straight out of the box. The strong steel grip plates are replaceable so there is no need to go easy. The TEKTON vise allows you to undertake projects that require a bit of brute force. See more information on TEKTON 4-Inch Swivel Bench Vise. The TEKTON is a great bench vise available from Amazon, for medium to heavy duty work at a great price. The vise will hold up to whatever you throw at it, within reason and can hold you over from the transition to light work to projects that require a bit more strength and security. The TEKTON is a great vise that can be a firm point as your skills improve and you take on more projects. The PanaVise 301 looks like a baby of a thing, and it is easy to underestimate what it can do. It is more geared towards electronics or other smaller projects. It may be small but it is mighty. Heat resistant up to 200 degrees Fahrenheit of direct continous heat exposure or 300 degress Fahrenheit of intermittent heat exposure. Let it be said that this mini vise is quite the little beast. It can easily be installed on any table top or work bench, and it can even be mounted higher if needed which isn't something that is useful or appropriate for vises of the bigger variety. The PanaVise is small, strong and precise. This flexible accuracy lends itself to more delicate work which usually leads to an specialist vise with an enormous price tag. See more information on PanaVise 301 Standard PanaVise. The PanaVise 301 is a fantastic mini vise. Perfect for smaller precision work including jewellery making, electronics and so much more. The versatility of the jaw placement and movement is invaluable to any project that works with precious or semi-precious materials. One of the PanaVise's biggest draws here that should be noted is its resistance to heat. Mini vises are sometimes made of inferior products such as cheap plastic, as they can relegated to the notion that they are only for crafts or little hobbies. Whereas, the PanaVise is a very serious and technical piece of kit. It is capable in assisting with various tasks such as soldering, light welding and grinding. That is what makes the 301 such a versatile vise, it can turn its hand to anything and withstand so much more than is initially evident by its size. The Grizzly G7062 is the big daddy of work bench vises. At a hefty 19kg weight it is not tiny and its not hard to see where this weight is from. Its cast iron body is built to be immovable when installed. Do not be put off by its weight, as it is not a cumbersome by any means. 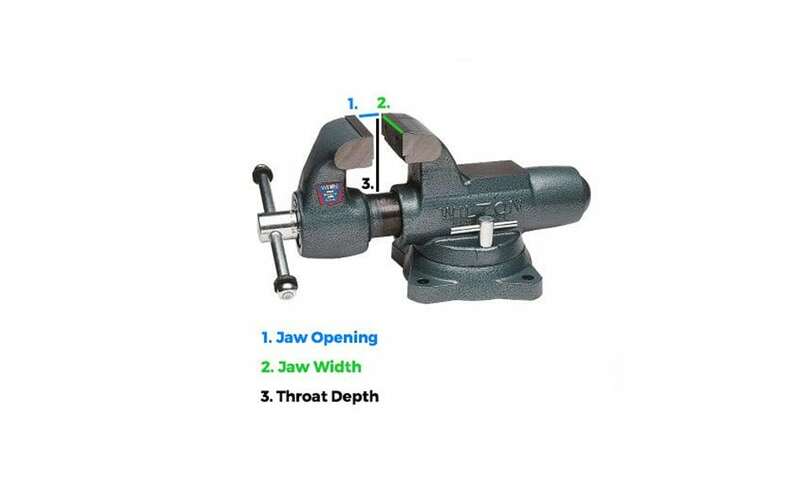 As mentioned in other reviews, the jaws open to a 5 inch opening, which is a decent size for a bench vise as the average is approximately 4 to 4 and a half inch. This is a testament to the build quality as the vise is large yet able to move to this size of opening relatively easily and smoothly. The rotating jaws house flat machined jaws, with excellent pipe jaws underneath. This aspect of the design is amazing. Many vises are now coming with pipe jaws, yet they are more often static, and found underneath the standard jaws. As these jaws rotate, it allows any piping or tubing work to be situated on top of the vise, above the bench top. This may not seem like a noteworthy point, but having the pipe jaws on top means that any intricate pipe cutting will be a lot simpler as it is in no way obscured. See more information on Grizzly G7062 Multi-Purpose 5-Inch Bench. As with other reviews on Amazon, the Grizzly is an absolute mammoth of a vise. The dual function and rotating jaws with a swivel base are features that you need in a heavy duty vise. It is a substantial vise and it can handle any small, medium or heavy duty work you throw its way. This product is built to be big and strong and to weather any storm. The Wilton 14500 bench vise feels like it should be bigger than it looks. It is a heavy piece of kit and its a great bit of kit at that and when you are using it, the tight grip and locked base give you a warm feeling that your work is in safe hands. This Wilton vise has dual locks for absolute stability. But the 14500's crowning glory is it's ability to be reversed. When the jaws are in the normal, standard position they will open to a very respectable 5 and a half inch opening. When the jaws are reversed, this opening expands to a fantastic 9 and three quarters of an inch. This ability greatly increases the scope of projects that you can undertake, as the vise can obviously handle much larger work-pieces than many of the other vises available. This vise is the quality that is expected from a brand like Wilton. See more information on Wilton 14500 4500 Reversible Mechanics Vise Base. The Wilton 14500 4500 is strong and sturdy and perfect for medium to heavy duty work. The two anvil areas are perfectly primed for a pounding and are great for metalwork of all shapes and sizes. The reversible jaw feature is great and allows you to work with larger pieces of material than it the norm this 2017. The HFS 4 inch lockdown vise is a slightly different kettle of fish, but it may be exactly what you are looking for. The HFS is designed for use with a milling machine and it does exactly what you need it to. It has been designed so that the horizontal force when tightened, push the jaws downward which helps keep the workpiece in the correct spot with no movement. Suitable for use for most milling machines, it out-performs similar vises that are over triple its purchase price. A perfect tool for anyone who will be using a milling machine. See more information on HFS (Tm) 4″ Milling Machine Lockdown Vise. Made from iron, this HFS vise has as much strength and function as you would expect from a vise that you paid double even triple for. Suitable for all mill work, this is a fantastic vise. It is unlike many other bench vises as it has a more singular purpose. It is a great vise for milling and drilling but wont be suitable for all the ad-hoc projects that pop up in the workshop. A vise is a mechanical device that is used to hold whatever you are working on still because let’s face it, no one wants to drill a moving target! Bench vises are quite obviously, vises that attach directly to your workbench and hold the workpiece, keeping your hands free to drill, file, sand or plane the piece. A key tool to have in any workshop. Jaw Opening, Jaw Width, Throat DepthThe vises themselves are of course designed to hold your work. They use adjustable jaws that clamp whatever you are working on together. The jaws are attached to a large main screw that runs through the vise. As you turn the handle, the jaws move further towards each other or further away by moving along the main screw. The uses for bench vises are practically endless. They are used in workshops and home garages alike and afford people the versatility to tackle whatever project they need. From woodworking to metalwork and even plumbing, bench vises can handle anything. The key is to find a bench vise that suits your needs. In these reviews, there are a few companies that can be considered market leaders such as Yost and Wilton, but Yost is a front-runner in the production of the bench vise. Their vises come in many shapes and sizes and service a range of needs this year in 2019. The prices are usually always competitive, which is always the main factor even if we sometimes wish it wasn’t. They deliver quality at a price that most people can afford. Yost make well-formed vises that work well with a variety of materials, whether its metal or wood. Features such as swivel bases and pipe jaws seem to be standard issue, while other makers are still leaving them off the smaller or the more reasonably priced bench vises. A bench vise works by attaching to your workbench. There are two ways this can happen, the first being a clamp on the bench vise. These vises have an adjustable clamp that clamps underneath and above the bench top to keep the vise in place. While this method of attaching a bench vise is easier, it is not universally preferred as it can feel less secure. An upside of this method is that you and move the vise and keep changing its placement on your workbench. The other method is to fix the vise directly onto the bench top by way of good old nuts and bolts. This is usually preferred as it affords you more security and little to no chance of the vise flying off while you are banging away on a piece of metal. There are also stands and baseplates available, that can increase the height of your vise. These are especially useful if you are doing detailed work, i.e. marking out measurements or soldering iron marks and are seated. Mini vises are usually installed on a stand as they are primarily being used while seated. Bench vises need to be kept stationary so any tool or tools can be used safely. As far as tools go, the bench vise may not be something that instantly comes to mind, but it is a very necessary tool. The bench vise may seem like a simple tool, and it is quite possible that you had not intended in putting so much thought into the purchase of one but it is worthwhile. The old adage is ‘a workman is only as good as his tools’, and it is true! A bench vise of poor quality and workmanship is only going to lead to problems. A bench vise but also suit your projects and your pockets. The quality and prices of bench vises vary drastically across the market but how do you know that you are getting what you need? Or even what you pay for? 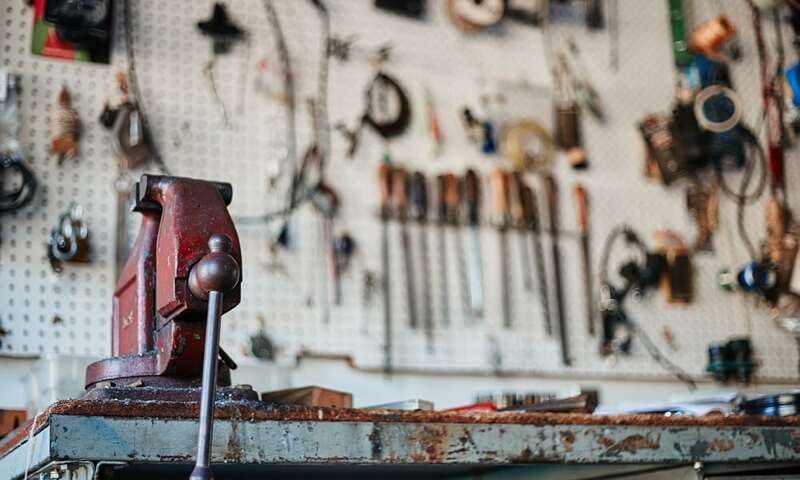 The most expensive tools do not automatically mean the best quality, and in a workshop environment with many hazards such as power tools and human error, we know you need confidence in what you are purchasing. A bench vise is not only best used in DIY or fabrication projects, it is also useful for many other uses. Such as securing blades when sharpening, i.e. lawnmower blades or bladed tools. 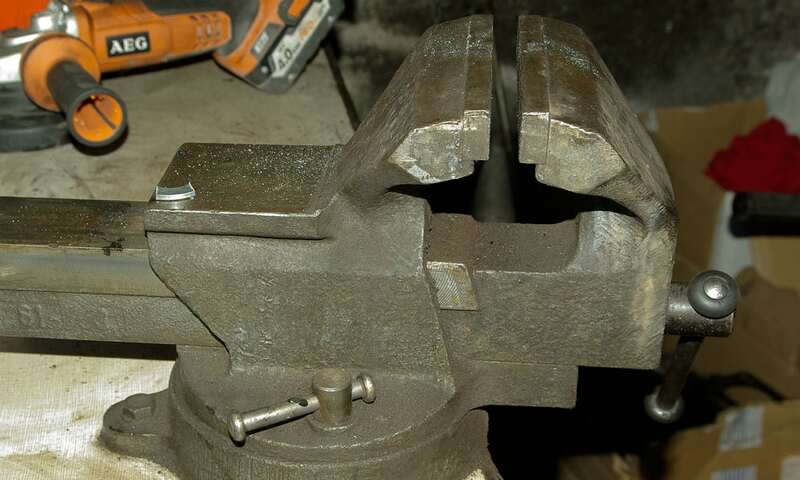 A bench vise must also take some abuse, as it will be knocked and banded around as the items you are working on are removed and reinserted and must also be able to take the vibrations from a drill and other tools, usually a hammer. Whether its bending metal or just you taking out your frustrations, that is fine. So the grips on the jaws of the vise must be tight and not prone to movement or slipping. A bench vise is not only useful in DIY or fabrication projects, it is also useful for many other uses. Such as securing blades when sharpening, i.e. lawnmower blades or bladed tools. A bench vise must also take some abuse, as it will be knocked and banded around as the items you are working on are removed and reinserted and must also be able to take the vibrations from a drill and other tools, usually a hammer. Whether its bending metal or just you taking out your frustrations, that is fine. This reviews guide has detailed the 10 best bench vises on the market to aid you in your purchase, but the choice is inevitably up to you and what serves your needs best. One person’s idea of ‘best’, is not necessarily the same as your idea of what is best. So go forth, and choose the best bench vise for you. Right now our top pick has to be the Wilton 11104 bench vise. Its sturdy workhorse construction lends itself to heavy work, and at a price that is unexpected. It isn’t overly heavy, which means it is not difficult to install. It is a great all-rounder and great for almost all projects. This fetching blue powder coated vise, has all the fixings for woodwork and metalwork with its large anvil surface that many vises are lacking and a secure double lock on the swivel for added stability. It can also be a great stepping stone as it will be suited to a workshop that is transitioning from beginner or hobbyist to something more akin to a professional standard or even more frequent use. This pick is a stellar choice for a majority, if not all workers and their requirements. Whether you are a hobbyist that will use the vise on an infrequent basis for light work or if it will receive much heavier use, it can withstand it all. You will be extremely grateful for this toughness if or when you make a mistake. The Yost Vises Multi-Jaw Rotating Bench has to be the best option for the premium choice here, as it is the only that can be described as such. This vises delivers so much more than what comes to mind when we think of a bench vise. The jaws are of fantastic design and the vise itself is of an almost peculiar design. The pull-pin feature of locking the mechanism is inspired and lends an easiness to working that you won’t realise you were missing. Almost all the other vises I have ever seen employ a handle or knob to control any tilt or swivel feature. These can stick or ‘gum up’, which makes it difficult top operate one-handed. Having a free hand may seem like something that is unimportant, but a free hand can be more than useful. Adjusting the vice position whilst securing the material is a lot simpler than constantly removing and replacing the piece at a different angle or position, as this leads to unnecessary wear on the and the increased likelihood of making a mistake. The build quality is second to none. The jaw placement is perfect for either horizontal or vertical placement of your material. When working with pipe or longer work pieces, vertical placement of the material is so much easier, and stops damage to the piece and to yourself. Many vises don’t compensate for the need for the jaws to clear the edge of the work bench. This vise does without sacrificing stability or design. Hobbyists and professionals alike will be pleased with this choice. There could be no winner for our great value pick, other than the Yost LV-4 Home Vise. The price is simply amazing for a mounted bench vise. Sporting a cast iron design with a stability that was utterly unexpected in a vise this size. For something this well made, with the features such as the swivel feature and the static pipe and tube jaws, you would certainly expect to pay more, a lot more. You can buy cheaper bench vises, but not of this calibre and honestly there isn’t many that exist any cheaper. The LV-4 is a great offering from Yost, and really rounds out their range. The vise is perfect for your home workshop or garage at a price that cannot be beat. Many vises available at this price as cheap knock-offs that will only snap when put under any slight strain. Many cheap vises are made from hollow, alloy casts that will break ridiculously easily, and which are of no use at all. The Yost LV cannot be lauded enough. Any beginner or ‘weekend warrior’ should start with the Yost LV. It is the perfect starter vise to gauge your interest and your needs for your workshop and your intended projects. We hope you enjoyed our article on "The 10 Best Bench Vises for the Job", if so, please share and rate it. This is the first bench vice I have bought and I wish I bought one years ago they are great value and good for occasional home projects. great review on Bench vises.